It was the most beautiful garden that anyone had ever seen. Its terraced lawns and manicured hedges were a delight to the eyes. Giant shade trees provided respite from the heat of the day. The brooks gurgled merrily and animals played joyfully without care or fear. The flowers basked in the sunshine and the trees gently waved their branches in the breeze. It was the most peaceful and serene place in all of the earth. The garden was unique in the fact that in the very center stood two trees. They were fruit trees; but they were not ordinary fruit trees. You could tell just by looking at them that they were magical fruit trees. Consuming the fruit of the first tree would cause you to live forever. Just by eating one piece of fruit would cause you to become immortal. If you ate the fruit of the second tree, you would be given the incredible knowledge of good and evil. The two trees were in a clearing which had a boundary of beautiful flowers encircling them, The most beautiful of all those flowers was the rose. The rose had a stem that was smooth as silk, dark green leaves, a brilliant red hue in its petals, and the most wonderful and pleasant fragrance. The garden had a name. Its name was Eden. Every day the keeper of the garden, a man named Adam, would go for a walk with the Lord God. They would talk about this and that, and just simply enjoy each others company. Whenever they walked past the rose, God would reach down and lovingly caress its petals. Adam also became fond of the rose. The garden had only one rule. The rose was listening as God gave Adam instructions concerning the two trees. Adam was forbidden to eat the fruit of the tree of the knowledge of good and evil. If Adam was to eat that particular fruit, he would die. The rose wondered why Adam was allowed to eat from the tree of life, but not from the tree of the knowledge of good and evil. The rose forgot about the conversation as soon as God came over to say hello to it. Adam had never been outside of the garden for his job was to tend all the plants and animals who lived inside. After a period of time however, Adam started to become lonely. Adam was, after all, the only human in the garden. God noticed Adam's lonliness and made plans to give him a human companion. She would be no ordinary human, for she would be made from Adam's own flesh. One day the rose watched in awe as God put Adam to sleep and fashioned a woman out of one of his ribs. The rose could see that the woman was the most beautiful masterpiece that God had put in the garden. The rose looked down at its own silky stem, and examined its leaves. It breathed in its own fragrance and then looked over at the woman. It was obvious to the rose that the woman was far more beautiful. 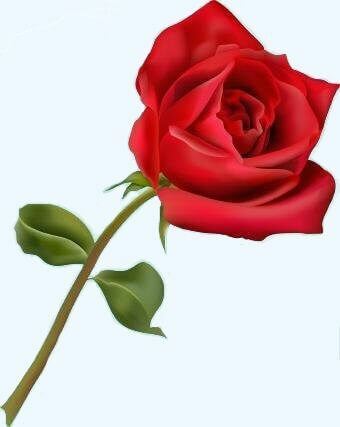 God glanced over at the rose, smiled, and then looked back down at the woman. He touched His finger to her lips and they became the same red color as the rose. It is for this very reason that even today, women still love the rose, though they have long since forgotten why. The rose was deeply honored and therefore was not jealous of the woman's beauty. Adam was fascinated by the beautiful woman whom he named Eve, and quickly lost interest in the rose. The Lord still stopped by and patted the rose on the head when He walked past. Every now and then as she passed by, Eve would bend over and give the rose a gentle kiss. It was her way of saying thank you. The rose became very fond of Eve. The rose was basking in the sun on that fateful day when it suddenly felt an evil presence in the garden. The rose felt a shiver go up its smooth stem and its petals shook in fright. It had never experienced evil before and it knew that evil did not belong in the garden. The devil took on the form of a serpent and deceived Adam and Eve into eating the fruit from the tree of the knowledge of good and evil. The rose was horrified. They had been warned by God himself not to eat that fruit. God was angry. Adam and Eve were afraid. The devil was frightened. The rose was terrified. God placed a curse upon the serpent, and upon the earth and its inhabitants. The rose felt itself changing as thorns grew out from its once smooth stem. Adam and Eve were kicked out of the garden and an angel stood guard to make sure that no one ever entered it again. The rose wept as weeds started to choke the garden. God surveyed the garden and walked over to the thorn-covered rose. He caressed its petals one last time and dried its tears. The rose blinked in surprise and looked into the loving eyes of the Creator. With a sweeping motion the Lord's hand pointed to the rest of the garden. The rose was filled with awe and respect. It wanted to ask about the plan, but the rose felt small and insignificant next to the grandeur and majesty of God. The Lord smiled at the rose and gave it a wink. The rose was delighted and timidly nodded its head. The rose was curious. How would God redeem man for disobeying and rejecting Him? The rose was horrified that God's Son would have to die. The rose was relieved and listened with fascination to God. “The curse I placed upon the earth has already changed you, my friend,” God said as he smiled upon the rose. The rose looked down in sorrow at the thorns now covering its stem. At this, the rose started to weep again. The rose stopped weeping and looked up expectantly at God. The garden was no longer the place of beauty that was once the pride of the earth. All of the paths and walkways became overgrown with weeds. The two trees in the center of the garden became entangled with vines and shrubs. Thorns grew everywhere and choked the plants. Mankind soon forgot where the garden was located. The flowers all moved out of the garden and took up residence throughout the earth. But the most beautiful of all the flowers, was the rose.